Cape Town (Friday 30 July 2010) – Greg Emslie, South Africa’s highest earning professional surfer, rode to victory in yet another internationally rated event on a Safari Surfboard shaped by master craftsman Spider Murphy when he won the ASP 4-Star rated O’Neill Cold Water Classic in Cape Town on Thursday. The 33 year-old East Londoner was in scintillating form throughout the event, using the same board to overcome the near gale-force winds and heaving two metre surf on the Cape Peninsula in the earlier rounds and in the milder conditions and well-shaped one metre surf on the final day. “I’ve been working with Spider for quite a few years now and we’ve probably been experimenting with more different shapes since I retired from the ASP World Tour last year. But I rode my standard shape, the one I’ve got my best results on, throughout this event” Emslie explained. Emslie really stepped up his performance on the final day, taking out the dangerous Shaun Cansdell (AUS) in the quarters, outpointing Antonio Bortoletto in the semis and then snatched the event title from Dion Atkinson (AUS) with an outstanding ride of 7.83 in the dying seconds of the final. “The crowd were all supporting me in the final and I was thinking that after Jordy had won in Durban and J-Bay, we’ve got to keep all the trophies at home. So I’m stoked I managed to do that,” Emslie said of his victory. The win earned Emslie 1 000 points on the ASP World Tour and the ASP Africa rankings and he pocketed US $12 000, taking his career prize-money earnings over the US $626 000 mark. Despite a shock elimination in Round 3 in Cape Town, fellow Safari Surfboards team rider Royden Bryson has taken the lead in the five-event O’Neill Cold Water Classic Series. The winner of the second event in Scotland a couple of months back, Bryson is marginally ahead of the Aussie trio of Tasmania event winner Stu Kennedy (AUS), Cansdell and Atkinson in the chase for the US $50 000 CWC prize-pool. DURBAN (Thursday 3 June 2010) – Safari Surfboards team riders starred in the 2010 South African Surfing Championships completed at St Mikes on the KZN South Coast on the weekend, winning four of the eight individual titles, finishing runner-up in two divisions and reaching the finals in another two. Former ASP World Tour campaigner Greg Emslie, SA’s highest earning pro surfer with more than US $600 000 in prize-money, clinched his second SA Open Men’s Title and, along with runner-up and fellow East Londoner, Devyn Mattheys, helped the Border provincial surfing team to secure the prestigious Presidents Cup. In the Open Women, reigning ISA World Masters Champion and Port Shepstone local Heather Clark showed she is well on the way to a full recovery after her horrific car accident last year by capturing her umpteenth national crown, while rising star Tanika Hoffman (Kommetjie) surfed her way into the final where she placed fourth overall. Former ASP World Pro Am champion David Malherbe from Coffee Bay was another who contributed to Border’s team victory by winning the Kahunas (over 45) division where Durban’s Murray Niven came in third. The peerless Chris Knutsen, a four-time SA Men’s Open champion in his heyday and the reigning ISA World Grand Kahunas (over 50) champion, maintained his unbeaten record since SA Masters events were introduced to the local surfing calendar back in 2007 by clinching his fourth consecutive national title. And for the second year in a row Grantley Read from Zululand finished runner-up in the Grand Kahunas. Safari Surfboards was established in 1963 and are the exclusive providers of Spider Murphy’s shapes. Contact boards@safarisurf.com for more information. 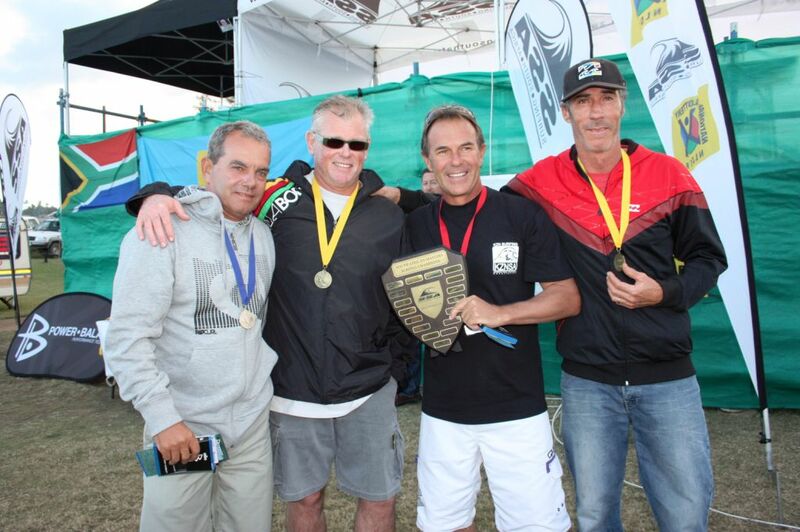 DURBAN (Monday 19 April 2010) – Durban based Safari Surfboards congratulates team rider ‘Lord’ Royden Bryson on winning the 6-Star rated O’Neill Cold Water Classic at the renowned surf break of Thurso East in Scotland today (Monday). The 27 year-old former East Londoner pocketed US $20 000 (approx. R150 000) and 3 000 precious ratings points by utilising all the practice he has gained in cold water and extreme weather since moving to Cape Town four years back to win the ‘Northernmost’ contest on the ASP World Tour which featured water temperatures of 4 degrees, sub-zero air temps and even a snow storm yesterday! Bryson credited his surfboards shaped by the legendary Spider Murphy at Safari Surfboards as a major factor in his victory. “I’m so stoked to have won this event and I’m very fortunate to have a shaper like Spider making my boards. All I’ve got to do is stand up and they go off!” Bryson said after being knighted with the unique Excaliber sword event trophy and being granted a small piece of land in Scotland over which he is now the ‘Lord’. Murphy was equally complimentary about Bryson, saying that the victory was the result of Bryson’s hard work and professional approach to his career. “Royden has shown that he is at home in any conditions. The 5’10” x 17 3/4 x 2 1/16 rounded pin he rode was ideal for his high-speed manoeuvres while the soft rails ensured that he didn’t bog anywhere on the face of the waves,” Murphy explained. ‘Lord’ Bryson is now joint top of the standings in the five-stop O’Neill Cold Water Classic Series with Stuart Kennedy (AUS), winner of the first event in Tasmania earlier this month. Both have a fifth place finish to add to their victories. The next event is in Cape Town at the end of July, followed by Canada and then Santa Cruz, California, where the series leader will be awarded a US $50 000 (approx. R375 000) prize-purse. Safari Surfboards was established in 1963 and are the exclusive providers of Spider Murphy’s shapes. Contact boards@surfarisurf.com for more information.